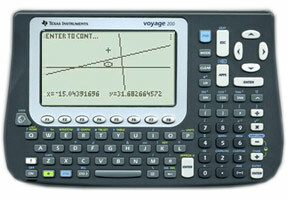 :: The Voyage 200 includes all the features of the complete Starpilot state-of-the-art solution for navigation computations in a hand-held calculator with the addition of a new, improved larger screen and regular typing keyboard. This package includes the following: TI Voyager 200 preloaded with StarPilot software. StarPilot CD and 70 page instruction manual. All StarPilot-Voyager programs are stored in ROM and are not affected by battery removal. StarPilot does celestial sight reductions of all bodies using high-precision internal almanac, plus mathematical and graphic solutions for position fixes, great circle, rhumb line, traverse and composite sailings, all current problems, piloting solutions, and much more...including lunar distance method of finding GMT from the sky and a unique graphical Sight Planner, and the new Sight Analyzer function that helps you get the most accurate results from a series of sights. The StarPilot is the state of the art solution to ocean navigation, fully up-gradeable with free upgrades available via Internet download, easy to use operation from logical menu lists, plus illustrated User's Guide with practice exercises. Options include: StarPilot software alone if you already have a TI-89 or it is more convenient to buy one yourself rather than our shipping it and PC-TI Link cable or equivalent, for those who already own a TI-89 and want to load the StarPilot into it. This type of link cable is also needed to move sight data and plots between calculator and PC and to install upgrades). This function is used to plan sights or simply as a "star finder" to identify what you see in the sky. It is a unique graphical feature of the StarPilot. The input is a latitude, longitude, date, and finally a time. Then StarPilot searches for sun and moon, then it searches through the stars, starting with the brightest and working down. Generally you can stop at about magnitude 2.0 (stars about as bright as the Big Dipper stars) by pressing the Exit key or if you want only the very bright stars, stop earlier. Then it starts to search the planets and then it plots out the sky as you see at the top of this page. It takes about 4 minutes to compute the sky to the magnitude 2.2 level shown above, including the moon and two planets. Just bright stars is quicker. If no special options are taken, sight reduction proceeds in a step-by-step sequence. Select Sight Reduction from the main menu, then select the body. StarPilot then asks for the sight time, and date, body name, DR Lat and Lon, as well as the Index Correction and Height of Eye. In this example we will be doing 3 star sights the example from the 1999 Nautical Almanac. They all have the same DR position, date, IC, and HE, so we are better off storing these values so we don't have to enter them each time. For all fixes, first step is to input speed, course, and fix time. The DR position is always in the center of the screen. It is a circled dot. The cursor is a "+" sign, which also first shows in the center of the screen on top of the DR. We can move the cursor around the screen with the arrow keys. StarPilot's plot option lets you hunt around this way to learn more about the process. If you would like to see another use of the plot option showing its value for an actual exapmle, see this page at Starpath.com. The StarPilot has been sold commercially since 1999 and is now used by thousands of mariners world wide from recreational sailing cruisers to professsional mariners on super tankers. StarPilot LLC is a wholly owned subsidiary of Global Marine Networks, LLC, a company that specializes in satellite based vessel email, weather, tracking and other communication services.